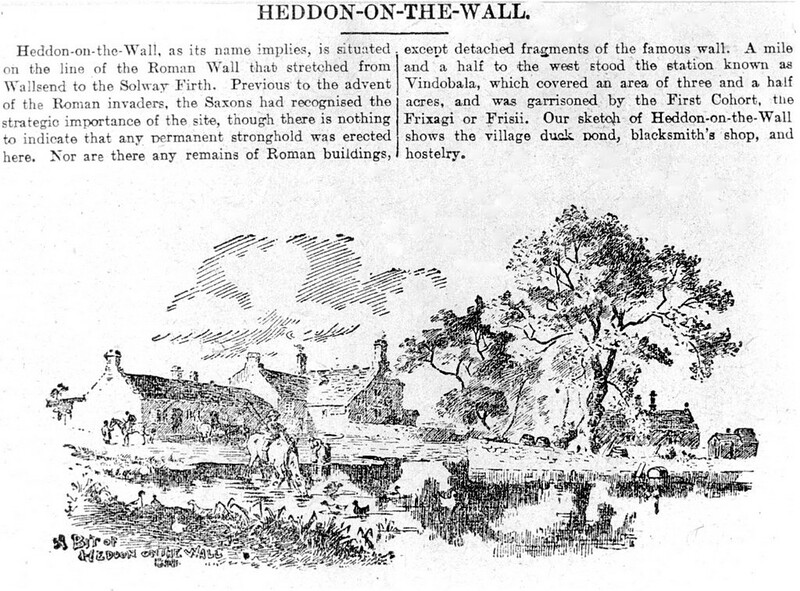 Heddon on the Wall is situated about 9 miles west of Newcastle upon Tyne and is bordered on the south by the River Tyne. The village stands on the site of the Roman Wall, from which the village derives its name. A piece of the wall is still visible on the edge of the village. In 1752, during the construction of the military road from Newcastle to Carlisle, workman found a large number of Roman coins and medals of silver and copper in the ruins of the Wall. They had been deposited in wooden boxes, which were almost decayed, but the coins themselves were in almost mint condition. In 1820, others cast in brass and copper were found dating from 286 AD to 395. They were presented to the Society of Antiquaries of Newcastle upon Tyne in 1856. At the south-east end of the village is a row of cottages known as Frenchman's Row. They were originally built at the end of the eighteenth century to accommodate colliery workers but in 1799 they were required for a different purpose. After the French revolution, all priests who refused to take an oath, which was different to the beliefs of their own church, were ordered to leave the country. Thousands of priests and nuns fled to England, where a number of them found refuge in Heddon occupying the now empty cottages. The priests put up a large sundial in front of one of these cottages to thank the people of Heddon for the kindness they had received during their exile. The inscription on the dial reads: 'time flies - memory remains'. In March 1960, the original row of cottages was pulled down and a new one put up in its place. The dial remains installed on the front of one of these new cottages. The Church of St Andrew is situated in the centre of the village opposite the Swan Inn. The church, which was consecrated in 630, has had a name change over the centuries. In the visitation of Archdeacon Thomas Sharpe, c. 1729, the church is called the church of St Philip and St Andrew. The combination of St Philip and St Andrew was so unusual that by 1772 it had become the church of St Philip and St James. St Philip and St James share the same saints' day of May 1 and is a more likely combination for a double dedication. This dedication remained until 1886 when it was restored to St Andrew. A Wesleyan Chapel was built in the village in 1877 at a cost of £450 and accommodates 150 people. Throughout its history, Heddon has thrived on a number of industries including coal mining, the quarrying of sandstone and limestone, brick making, and agriculture. Coal mining in particular has had a long connection with Heddon, stretching some 400 years. In 1784 a Heddon Colliery was the first in the trade to use mechanical means of 'screening' or separating the coal according to its size. The last deep mine to be worked in Heddon was the Margaret Pit. In addition to supplying coal to the village, it also provided coal and clay to the nearby Heddon brick works. Apart from a few small businesses, such as the ironworks belonging to the Amos Bros, and a small number of farms, Heddon on the Wall now exists primarily as a residential village for those who work in Tyneside or elsewhere in Northumberland. Heddon became the focus of the world's media in 2001 when a major foot and mouth disease outbreak started in the village.